Defining stress is kind of like defining happiness or success; everyone has a general idea of what it is, but no one can agree on one definition. It can be hard to define stress because we use the same word for the problem as we do the result. So we end up feeling stressed (headaches, colds, body aches, lashing out, etc.) about the things we're stressed about (work, relationships, money, projects, etc.) .. Confusing right? Basically, stress is what happens when you feel you don’t have control over a situation. The first thing to note is that stress looks different for different people. What energizes you, may completely tear apart someone else. What drives someone else crazy, may be no big deal for you. That being said, stress-management will look different for us as well. 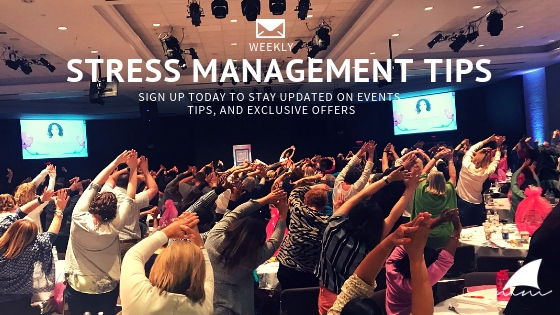 Stress shows up in tons of different ways and what's important is that we know what that looks like and find what works for us as individuals to manage that stress. Now don't get me wrong. Stress is not always a bad thing. It's actually built into us and necessary for survival. Feeling stress is what releases the adrenaline we need to run from a loose dog or lift up a heavy object that has us pinned down. But there's levels to this. We have stress like eustress, which is “good” stress. This is stress from things like job interviews and roller coasters, this stress is typically seen as beneficial and just kind of gives us that little push we need. Then, there's distress, this is the type of stress we hear about more often. Distress usually looks more like hating your job, going through a divorce, knowing DeBo (Friday) is about to make his rounds on your block, or meeting a deadline that will make or break your career. This is that type of stress that is continuously eating at you. The stuff on your mind when you go to bed and when you wake up. This chronic stress is what makes us sick. This is what we need to learn to identify and manage. The most important part of creating a stress management regimen, is knowing your stressors. You need to know what triggers stress for you. I can remember wanting to bolt out of my job at least twice a week. When I really sat down and assessed the situation, I was able to recognize that it was whenever we were making a change to a process. It wasn’t even just the change that was irritating the innermost parts of my soul, it was the change without knowing why. When I was able to identify that this delivery for change was a stressor for me, and I could calmly articulate that message to my team, I addressed it. My team understood my frustration and was sympathetic to my position, our relationship became stronger, and I only kinda wanted to bolt out of there once a week ;-). Kidding. Another very important component to stress management is knowing how we react personally when it comes to stress. For me, it’s usually stuffing my face with asian food (all kinds, I don’t discriminate), disappearing (bolting to isolation), or bottling it up til I crack. It still happens to me sometimes, even as a stress-management teacher, but I can recognize when I’m headed there and am able to talk myself down from the ledge or at least not linger there too long. It is so important that you manage your stress because, unfortunately, it’s not going anywhere. Honestly, stressors are just becoming more intense. Like these smartphones? This is a developing stressor and probably one of our biggest challenges. It’s always in a 2 ft reach, constantly going off to alert you about what everyone else is doing, and updating you on your new political cabinet *kneels in prayer… prays super hard*. Check out my free eBook Mako Mindfulness: 9 Tools for Stress Management to help you get started with identifying your stressors. In this book, I discuss stress and show you 9 tools you can use to immediately start creating your stress management routine. Drop your email below & your book will be on it’s way. Got it! Now, check your email and enjoy your book! Thank you. Make sure you’re on my email list (you’re in if you just got the book)! You can also scroll to the bottom of this page & enter your email address there. In the next few days I will be releasing my newest course which is a comprehensive stress-management & self-care membership site (also the reason you haven’t heard from me in awhile). Here, you will be able to learn and practice mindfulness, meditation, positive mindset techniques, dynamic mindfulness (a trauma informed intersection of yoga, mindfulness, and meditation), breathing exercises, mindfulness for kids.. the list goes on. You will also have access to a community of others on their self-care journey and accessible tools to build your own practice. Also, new content will be made available monthly. The theme of this site is accessibility, I love getting to a 60 minute yoga class after work but how amazing would it be to feel that good and know how to release tension in the middle of a crazy day? Folks on my email list will receive a special offer for their membership so be sure to sign up today! I’m looking forward to working with you and growing this community. Thank you for your continued support, and as always, let me know if you have any questions.